BACKGOUND: Esophageal squamous cell cancer located in the lower third of the esophagus often indicates surgery with left transthoracic approach. Surgery with left thoracotomy is less invasive than right thoracotomy, but thoracotomy itself is associated with morbidity and delayed recovery in cancer patients who are typically older and malnourished and often have pulmonary or cardiovascular complications. Minimally invasive esophagectomy without thoracotomy has the potential advantages of an easier recovery after operation and fewer pulmonary complications. AIM: To assess our outcomes after laparoscopic transhiatal esophagectomy with intrathoracic gastric or jejunal reconstruction without thoracotomy. Method: Between January 2006 and August 2008, we introduced laparoscopic transhiatal esophagectomy with intrathoracic gastric or jejunal reconstruction. In the earlier experience we faced difficulty in the intrathoracic anastomosis. Between August 2008 and August 2009, we introduced the peroral anvil technique( EEA OrVil®) for intrathoracic anastomosis with circular stapler for 9 cases. 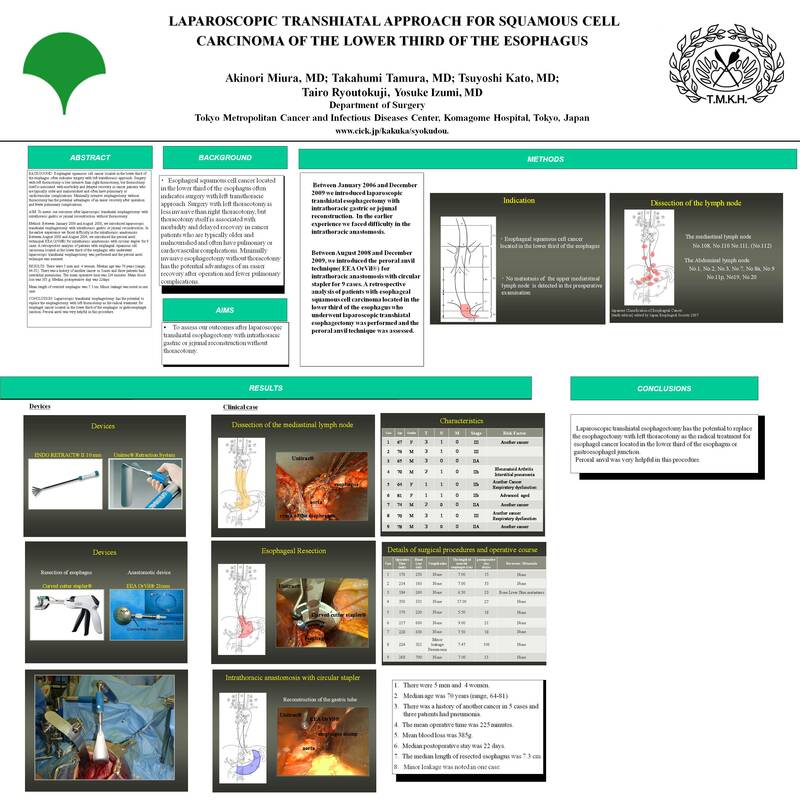 A retrospective analysis of patients with esophageal squamous cell carcinoma located in the lower third of the esophagus who underwent laparoscopic transhiatal esophagectomy was performed and the peroral anvil technique was assessed. RESULTS: There were four men and five women. Median age was 70 years (range, 55-81). There was a history of another cancer in three cases and three patients had interstitial pneumonia due to neoadjuvant chemoradiotherapy. The mean operative time was 224 minutes. Mean blood loss was 321g. Mean postoperative stay was 21 days. Mean length of resected esophagus was 7.5 cm. Minor leakage was noted in one case. CONCLUSION: Laparoscopic transhiatal esophagectomy has the potential to replace the esophagectomy with left thoracotomy as the radical treatment for esophageal cancer located in the lower third of the esophagus or gastroesophageal junction. Peroral anvil was very useful in this procedure.